CheapOair Canada, online at CheapOair.ca, is your online destination for booking affordable travel from Canada to exotic cities around the world. At CheapOair Canada, you can buy plane tickets, purchase business class tickets, book hotel accommodations, and order car rentals. CheapOair Canada also allows you to book last minute travel and find out about travel deals. Vacation deals to places around the world from New Orleans to Jamaica to Cancun can also be purchased at CheapOair Canada. RetailSteal.com has the best CheapOair Canada coupon codes, CheapOair Canada discounts, CheapOair Canada coupons, and CheapOair Canada promo codes. Shipping and handling rates do not apply to most orders at CheapOair Canada. See website for full details. Save up to 65% on your next flight on CheapOair Canada + enjoy a C$15 discount when you use this coupon code. Click to save. Buy business first class tickets and save C$35 on your airfare at CheapOair Canada. Click link to purchase now. Coupon applies on fares of C$ 2000.00-20000.00. Book travel at CheapOair Canada and save C$15 on international flights by using the coupon code. Click link to save. Click our link to shop online at CheapOAir Canada today and use our coupon code online to enjoy up to C$50 savings on flights. Enjoy a C$15 discount on last minute flight deals from CheapOair Canada. Click link to shop the latest offers and use coupon code to save. Book your next trip with CheapOair.ca and use this code to enjoy a C$10 discount on hotel rates. Enjoy up to C$100 savings on Business & First Classs flights and travel deals from CheapOair Canada when you use this coupon code. Click to save. Save up to 65% on your next flight at CheapOair Canada. Click link to book travel now. Use this code at CheapOair Canada for C$35Off + Business Class Flights of C$2,000. Click link to book. Receive C$20 when you sign up for the e-mail newsletter at CheapOair Canada. Click link to sign up. Enjoy round trip airfares as low as C$238 when you book last minute travel at CheapOair Canada. Click link to book online. 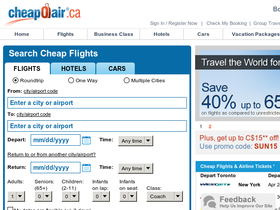 Save C$15 at CheapOair.ca when you plan Fantastic Flights for Family Trips with this code.